This story was updated at 1:30 p.m. EST. On the eve of space shuttle Discovery's final scheduled trip back to Earth, the six astronauts aboard the spaceship paid tribute to their tried and true orbiter. "I think the legacy that this shuttle has made for herself is just nothing short than cause for celebration," said mission specialist Michael Barratt during a call with reporters today (March 8). "Just something that our country should be very, very proud of." After this STS-133 mission, only two more space shuttle flights remain, and then NASA is retiring the fleet. Shuttle Endeavour is slated to launch on its STS-134 voyage in April, and Atlantis is scheduled to blast off one last time on the STS-135 mission in June. Over the course of 39 missions, Discovery has launched probes and satellites, deployed the Hubble Space Telescope, and then visited to repair it. The shuttle has also contributed significantly to the construction and operation of the International Space Station. "The legacy for the shuttle fleet and the shuttle program undoubtedly, in my mind, will be the space station," LeRoy Cain, NASA's mission management team chairman, told the media today. "We could not have assembled this marvelous facility in orbit without the capabilities of the space shuttle." After the shuttles retire, they will be sent to U.S. museums for public display. "I don’t know what the plaque is going to say, but hopefully it will talk about Discovery's legacy as a great ship of exploration, as a class of spacecraft with capabilities … unmatched by anything else we've ever seen in space and probably unmatched for a long, long time to come," said Discovery's commander, Steve Lindsey. 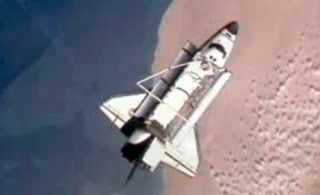 "Hopefully it will talk about not the crews, not us, but the entire space shuttle teams that span across the country that have allowed this to happen – the thousands and thousands and thousands of people to keep this vehicle running. Hopefully the legacy will be more about the people than anything else." "There is not a single thing wrong with her," Lindsey said of Discovery, the oldest of the shuttles. "Every single system and every piece of every system is working just like it's brand new." Once it retires the shuttles, NASA will have to rely on Russian Soyuz spaceships to get to the International Space Station until American commercial companies start producing vehicles capable of doing the job. No spaceship under development will be able to carry so many crew members and so much cargo to the station as the massive shuttles have. "It's going to be sad when it's over, when we land tomorrow or the next day," Lindsey said. "The hardest part of this for me is giving up the capability. It can do everything except leave low-Earth orbit." Yet he said it was the right thing to do. "It's sad to give up this type of capability, but I really strongly believe in the next step to try to get out of low-Earth orbit, to try to go to an asteroid, go to the moon," Lindsey said. "We do need a new vehicle for that." Other astronauts expressed similar sentiments. "There are plenty of opportunities out there, and we're a great country that has done really, really amazing things with our space program and I really just hope that that will continue," mission specialist Nicole Stott said. Discovery is scheduled to land tomorrow at NASA's Kennedy Space Center in Cape Canaveral, Fla., at 11:57 a.m. EST (1657 GMT).